After the passing of a loved one, it is normal to feel a helpless and overwhelmed with grief. As common as it is to experience a great amount of sorrow, it is also an undeniable fact that it may be extremely difficult to handle and overcome. Seek and Accept Support. – Call on a trusted family member or friend, church clergy, or professional councilors. Call your local hospice agency or community grief center for advice to get you started. Accept Your Grief. – Don’t try to run and hide from your grief. You need to experience the pain and sorrow to be able to move past it and on towards healing. Find Role Models. – You are not the first to travel the road of grief. Discover how others have coped with loss before you. This will provide you with a model to base your own healing on and remind you that you are not alone. Express Your Grief. – Grief cannot stay hidden deep within you. The best way to work through grief is to let it out. Cry, scream, and yell if need to. Express your feelings through music, art, poetry, or journaling. Get Involved in Something. – Getting involved in work or some other activity you enjoy can keep you focused and offer a welcome distraction from your grief. If that activity is especially meaningful or helpful to others, you might find it also raises your spirits. Have a Little Fun. – Sometimes grieving people won’t allow themselves to have any fun – as if sharing a laugh with someone is somehow dishonoring the memory of their loved one. The truth is laughter is excellent medicine. A great way to have some genuine fun is to surround yourself with children or animals. Keep the Faith-. Remember that intense grief doesn’t last forever. One of my favorite sayings goes “Faith is not the absence of fear, but the willingness to go on when fear is present”. Keep the faith that you will one day heal and be whole again. 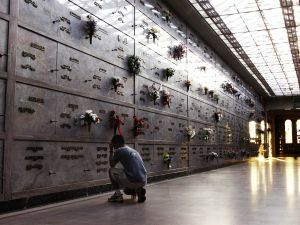 For more on how to cope with grieving, click here.